The Wide-field Infrared Survey Explorer (WISE; Wright et al. 2010) 3-Band Cryo Data Release contains 3.4, 4.6 and 12 μm (W1, W2 and W3) image and extracted source data that were acquired following the exhaustion of solid hydrogen in the satellite's payload outer cryogen tank. WISE surveyed 30% of the sky between 6 August and 29 September 2010 UTC while the detectors continued to be cooled by the hydrogen ice in the inner cryogen tank. The telescope warmed from the 12 K maintained during the main mission to 45 K. During the 3-Band Cryo survey phase, the 3.4 and 4.6 μm detectors operated with nearly the same sensitivity as during the full cryogenic survey. Higher operating temperatures and elevated thermal emission from the warming telescope reduced the sensitivity of the 12 μm measurements and fully saturated the 22 μm detector. The WISE 3-Band Cryo Data Release products include an Atlas of 5,649 match-filtered, calibrated and coadded image sets and a Source Working Database containing positions and 3-band photometry for over 261 million sources detected on the Atlas Images. A guide to the format, content, characteristics and cautionary notes for the 3-Band Cryo Release products is provided in section VII of the WISE All-Sky Release Explanatory Supplement. 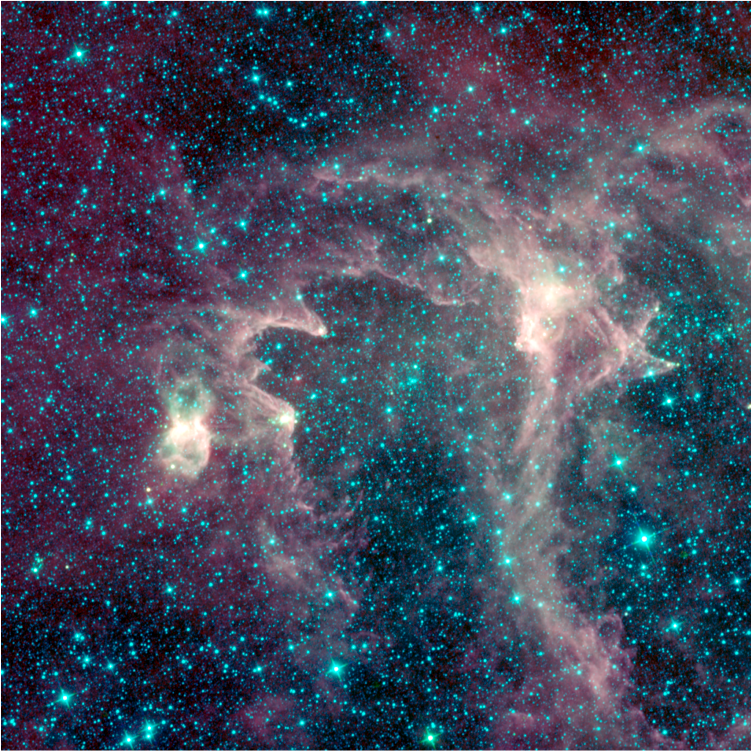 The WISE All-Sky Data Release that includes data taken during the mission's full cryogenic phase remains the best compendium of sources of mid-infrared emission over the entire sky. Because the 3-Band Cryo observations were an independent, second-epoch measurements of 30% of the sky, the 3-Band Cryo Release Atlas and Source Database are best used as resources with which to learn more about objects found in the All-Sky Release Atlas and Catalog, such as proper motion, flux variability over six month timescales, and confirmation of faint, marginally detected sources. In addition, the 3-Band Cryo observations fill in some of the low coverage gaps in the All-Sky Release products. Please include this acknowledgment in any published material that makes use of WISE data products. Research using WISE Release data is eligible for proposals to the NASA ROSES Astrophysics Data Analysis Program. Figure 1 - Equatorial Aitoff projection sky map showing the average number of individual Single-exposures within 14´ × 14´ spatial bins going into the WISE 3-Band Cryo Release Atlas and Source Working Database. Colors encode different frame depths-of-coverage as specified by the legend on the left. 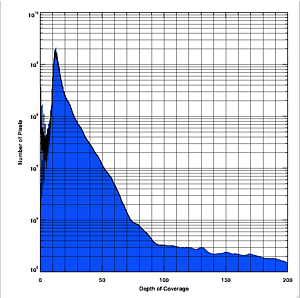 Figure 2 - Differential area in Atlas Image pixels (1 pix covers 1.9 arcsec2) as a function of average W1 frame depth-of-coverage in the 3-Band Cryo Atlas and Source Database, computed from the depth-of-coverage maps. Exposure times were 7.7 sec in W1 and W2. The W3 exposure time was 8.8 sec at the beginning of the 3-Band Cryo phase and was then reduced to 4.4 sec, 2.2 sec, and finally 1.1 sec as the thermal emission from the telescope increased. As illustrated in Figure 1, the survey scanning strategy resulted in 12 to 13 exposures of each point on the ecliptic plane. Coverage increases to over 1000 exposures at the ecliptic poles. Individual 3-Band Cryo exposures that met minimum requirements for image quality and noise levels were combined to form the Image Atlas and Source Working Database. The localized decreases in coverage in small areas seen in Figure 1 are the result of exclusion of lower quality exposures. Additionally, coverage depth was artificially capped at approximately 160 exposures near the ecliptic poles for processing runtime and memory usage requirements. A plot of the approximate differential area as a function of the average W1 exposure depth-of-coverage realized in the 3-Band Cryo Release Atlas and Source Working Database is shown in Figure 2. The peak near 12 coverages corresponds the ecliptic plane. Pixel-level frame effective coverage information is provided in the WISE Image Atlas depth-of-coverage maps. Figure 3 - (left, top row) W1, W2 and W3 intensity images, (left, center row) depth-of-coverage maps, and (left, bottom row) uncertainty maps for the Atlas Tile 0450p605_ab31 that contains the center of the W5 star formation region (IC1848). The color scale on the bottom of the grid refers to the depth-of-coverage maps. (above) 3-color composite intensity image for this same Tile, with W1 mapped to blue, W2 to green, and W3 to red. The WISE 3-Band Cryo Image Atlas is comprised of 5,649 4095x4095 pixel @1.375"/pix FITS format image sets. One image set is produced for each predefined Atlas Tile. The 1.564°x1.564° Atlas Tiles are built on an equatorial projection and are distributed in 119 iso-declination bands with 238 Tiles on the celestial equator and six Tiles in the |δ|=89.35° declination band. Tiles overlap by 180" in RA and Dec on the equator, and the RA overlap increases towards the equatorial poles. 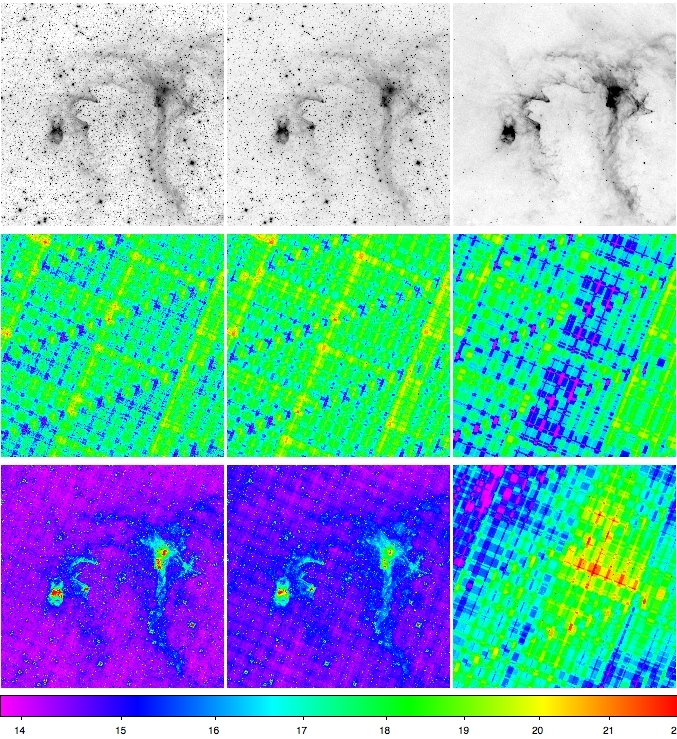 Intensity images - Three spatially registered images, one in each of the W1, W2 and W3 bands, produced by match-filtering and coadding multiple 7.7 sec (W1 and W2) and 8.8/4.4/2.2/1.1 sec (W3) Single-exposure images covering the Tile area. Because of the matched filtering, the SNR in the Image Atlas is optimized but the angular resolution is degraded by a factor of sqrt(2). Pixel outlier rejection used during coaddition suppresses transient events such as cosmic rays, hot pixels and satellite trails when there are five or more Single-exposure images available. Depth-of-coverage maps - Three maps, one in each of the W1, W2 and W3 bands, that provide the realized frame coverage for each pixel in the corresponding coadded intensity images following outlier rejection. Uncertainty maps - Three images that give the propagated 1σ uncertainty for each pixel in the corresponding coadded intensity images. The uncertainty maps should be used for error estimation when making photometric measurements on the intensity images. The headers of each Atlas Image provide WCS information to convert pixel to equatorial coordinates and photometric zero points for calibration of relative photometry. See section VII.2.b of the WISE 3-Band Cryo Release Explanatory Supplement for more information about the content and format of the Image Atlas. The WISE 3-Band Cryo Source Working Database contains the attributes for 261,418,479 point-like and resolved sources detected on the 3-Band Cryo Atlas Intensity images. CAUTION: The 3-Band Cryo Source Database is not a highly reliable, well-vetted list of mid-infrared sources like the WISE All-Sky Release Source Catalog. The Database contains both detections of real astrophysical objects, as well as spurious extractions of image artifacts and transient pixel events such as noise excursions, and redundant detections of objects in the Atlas Tile overlap regions. As a result, the 3-Band Cryo Source Database is best used as a resource for learning more about objects found in the WISE All-Sky Release Source Catalog. J2000 positions and uncertainties reconstructed using the 2MASS Point Source Catalog as the astrometric reference. Astrometric accuracy is approximately ~200 mas RMS on each axis with respect to the 2MASS reference frame for sources brighter than SNR=40. Photometry and uncertainties in the WISE W1, W2 and W3 bands. Photometry is performed using point source profile-fitting and multi-aperture photometry. Photometric sensitivity during the WISE 3-Band Cryo survey phase is within ~10% of the full-cryogenic phase sensitivity in bands W1 and W2. W3 sensitivity is significantly reduced because of the higher thermal background levels and the reduced exposure times. Measurement quality flags, image artifact contamination flags, extended source and variability flags, and association information cross-referencing WISE 3-Band Cryo sources with the WISE All-Sky Release Source Catalog and the 2MASS Point and Extended Source Catalogs. Relative photometric calibration for WISE source photometry is made using measurements of a network of calibration standard stars near the ecliptic poles. The WISE bandpasses and relative spectral response curves are available in Section IV.4.h.v of the WISE All-Sky Release Explanatory Supplement. See section VII.2.a of the WISE Explanatory Supplement for more information about the content and format of the 3-Band Cryo Source Working Database. In addition to the Image Atlas, Source Working Databse and Explanatory Supplement, the WISE 3-Band Cryo Release includes several ancillary data products. Single-exposure Image Sets - 392,879 calibrated 1024x1024 pix @2.75"/pix FITS image sets for the individual 7.7 sec (W1 and W2) and 8.8/4.4/2.2/1.1 sec (W3) WISE survey exposures. Each image set consists of three intensity images, noise maps, and bit-masks indicating pixel use status, one each for the W1, W2 and W3 WISE bands. Single-exposure Source Database - Database of 3,703,319,374 "source" detections from Single-exposure images useful for time domain studies and follow-up of objects in the Source Working Database. This database contains detections of real astrophysical and solar system objects, as well as spurious extractions of low SNR noise excursions, transient events such as cosmic ray strikes and noisy pixels, and artifacts and scattered light from bright sources including the moon. Known Solar System Object Possible Association List - Database of asteroids and comets, known at the time of data processing, that are predicted to be in the field-of-view of WISE 3-Band Cryo Single-exposures. For objects with predicted positions in close proximity to a WISE Single-exposure detection, the WISE source information is given. This is not a vetted list of solar system object detections. Refer to the Moving Object Tracklets identified as part of the NEOWISE program (Mainzer et al. 2011) for such a reliable list. See sections VII.2.c-j of the WISE 3-Band Cryo Release Explanatory Supplement for more information about the content and format of each of the Ancillary Products. The WISE 3-Band Cryo Release data products can be accessed via the on-line and machine-friendly services of the NASA/IPAC Infrared Science Archive (IRSA). IRSA services are VO compatible. Tabular Data - Simple and complex queries on WISE tabular data products including the Source Working Database, Single-exposure source database, and image metadata tables can be made using the IRSA/GATOR general catalog query engine. Image Data Access - The IRSA/WISE Image Service enables viewing and downloading WISE Atlas and Single-exposure image sets using position/area-based and object named queries. Custom projection, re-sampling and small mosaics of WISE images can be obtained using the IRSA Image Mosaic service. Solar System Object Searches - A special capability of the IRSA services is the ability to search for WISE Single-exposure image and extracted source data for solar system objects. Searches can be made for either known objects, or in a "pre-covery" mode for newly-discovered objects via user-specified orbital elements. See section VII.1.c of the WISE 3-Band Cryo Release Explanatory Supplement for a complete description of how to access WISE data products. "This publication makes use of data products from the Wide-field Infrared Survey Explorer, which is a joint project of the University of California, Los Angeles, and the Jet Propulsion Laboratory/California Institute of Technology, funded by the National Aeronautics and Space Administration."